They aren't doing air guitar, believe it or not... Although there is a certain Elvis-like thing going on with the hairdos. This is the second time Ive had the pleasure of attending the March sumo honbasho, an annual "major" tournament in Osaka. There are six of these tournaments every year, each help determine a wrestler's ranking. 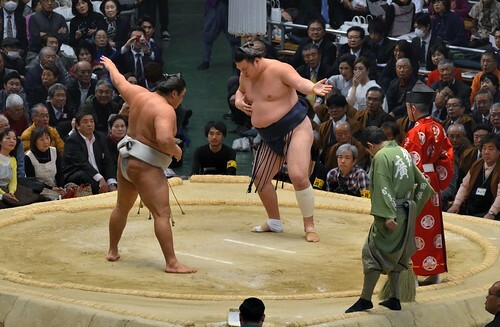 Sumo is heavily steeped in tradition, primarily Shinto ceremony and symbolism--it's an excellent lesson not only in sport, but Japanese culture. These photos are from the top division (makuuchi) matches. Osaka Prefectural Gymnasium. Namba, Osaka.